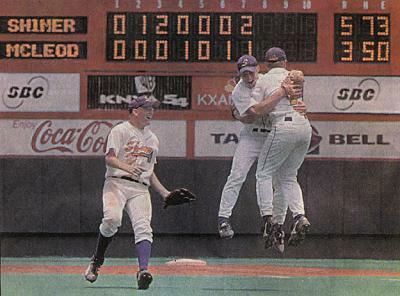 Shiner players celebrate their 5-3 Class 1A championship victory over McLeod on Thursday at the UIL State Baseball Tournament at Disch-Falk Field in Austin. AUSTIN - For a small town, Shiner left a big mark on Austin the past six days. After the Lady Comanches claimed their second straight Class 1A softball title on Saturday, the Comanches would not be outdone on Thursday. The Comanches used two defensive gems to secure a 5-3 victory over the McLeod Longhorns and claim the Class 1A state baseball title at Disch-Falk Field. "You dream about this all season and for it to come true is awesome," said sophomore pitcher Garet Pustka, who was named the game's MVP. Taking their lickings early in the season, the young Comanches slowly began to put things together by stressing fundamentals. Those fundamentals paid dividends early for the Comanches, who start four freshmen and two sophomores. Shiner executed to near perfection in the second to take its first lead, one they would never relinquish. "When we started out this year, we weren't very good," said Comanches coach Steve Cerny, whose club ended the year at 23-10. "We started concentrating on the basics and things started going our way." Freshman R.J. Lester opened the second with a single to left and after freshman Brady Strauss beat out an infield single, sophomore Marcus Lopez put down a perfect sacrifice bunt. Freshman Scott Shimek then drove Lester home with a sacrifice fly to center and the Comanches were on their way to their third state title in 21 years. 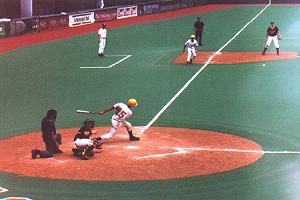 The Comanches claimed the Class 2A title in 1981 and again in 1992. While youth seemed to propel the Comanches early, it was senior second baseman Kelsey Pohler who stepped up big in the bottom of the seventh to preserve the victory. The Comanches took a 5-2 lead into the bottom of the seventh and then had to fend off a late rally by the Longhorns. Pustka found himself in a jam as he hit Greg Dickerson to lead off the inning and then misplayed a one-out grounder off the bat of Paul Weems. With runners at first and second, Justin Endsley lined a soft liner into shallow right field which Pohler managed to run down for the second out. Josh Endsley then slapped an RBI single to center to score Dickerson and cut the lead to 5-3. Jody Dempsey followed with a hard line shot that Pohler managed to glove for the win. "That first one by Kelsey was just awesome," said Cerny. "If we don't get that out, things would have really gotten tight for us. That's a senior coming through in the clutch." Senior Adam Dawson, who picked up the win for the Comanches in their 12-4 semifinal win over Windthorst, agreed. "For four years we've preached don't ever give up until we get the gold and in that one second when Kelsey caught that (last) ball, it made it all worth it," said Dawson. Shiner freshman Chris Baer hits an RBI single in the seventh inning to score freshman Jared Boedeker from third base on Thursday at the UIL State Baseball Tournament at Disch-Falk Field in Austin. Shiner took a 3-0 lead in the third as Chris Baer beat out an infield single and stole second before moving to third on a wild pitch. Dawson then drew an intentional walk. Josh Ednsley then unleashed another wild pitch, scoring Baer and moving Dawson to second. Pustka followed with a shot between short and third, scoring Dawson. McLeod (25-8) began chipping away at the lead in the fourth when Dempsey walked, stole second and scored on Jason Beasle's high-chop single behind second on a hit-and-run. In the sixth, the Longhorns took advantage of a Comanche throwing error to pull to within one at 3-2. Dempsey beat out an infield single, but when Shimek's throw sailed past Strauss at first, Dempsey moved to second. Dempsey stole third and with one out raced home on Cliff Rowell's groundout to short. "We broke down a little bit, but these kids believe in themselves and that's important," said Cerny. "There's a lot of pressure in this game and I was very impressed with how they handled themselves all season." The Comanches bounced right back in the top of the seventh, plating a pair of insurance runs on an RBI single by Baer and a sacrifice fly from Dawson. Josh Endsley started the inning by hitting Jared Boedeker and Pohler and Baer followed with a single to left. Dawson then plated Pohler with a long fly to center. "This was sweet," said Cerny. "The girls put the pressure on us earlier (with their title) so we had to come through." Garet Pustka and Chris Baer. Josh Endsley and Cliff Rowell. W - Pustka (10-4) L - Endsley (10-4). 2B - (S) Adam Dawson. SB - (S) Baer 2, Todd Wenske; (M) Jody Dempsey. - Baer 2; Wenske; Dempsey 2. Win - Pustka (). Loss - Endsley, Jo. (). Save - None. WP - Endsley, Jo. 3. HB - Pustka; Endsley, Jo. 3.
lf line. Pustka struck out looking. 0 runs, 1 hit, 0 errors, 1 LOB. Endsley, Ju. struck out swinging. Endsley, Jo. out at first p to ss to 1b. Dempsey struck out swinging. 0 runs, 0 hits, 0 errors, 0 LOB. Lester advanced to third. Shimek flied out to cf, SF, RBI; Lester scored. Boedeker grounded out to 3b. 1 run, 2 hits, 0 errors, 1 LOB. Pustka to p for Wenske. Jones struck out swinging. Weems grounded out to 2b. Endsley, Ju. out at second ss to 2b. 0 runs, 1 hit, 0 errors, 1 LOB. Weems struck out swinging. Endsley, Ju. out at first 1b to p. Endsley, Jo. Dempsey singled to third base, advanced to second on a throwing error by 3b. Pohler scored. Pustka popped up to 2b. 2 runs, 1 hit, 0 errors, 0 LOB. unearned. Dempsey lined out to 2b. 1 run, 1 hit, 1 error, 2 LOB.